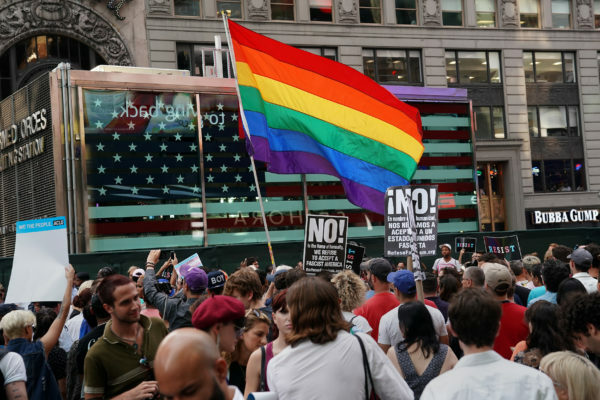 A rainbow flag flies as people protest U.S. President Donald Trump's announcement that he plans to reinstate a ban on transgender individuals from serving in any capacity in the U.S. military, in Times Square, in New York City, New York, U.S., July 26, 2017. When President Donald Trump casually ordered the Pentagon on Wednesday to ban transgender service members from the military, he didn’t just undo months of work by military officers, civilian policymakers and trans advocacy groups. He also cut off transgender Americans from an institution that’s historically been viewed as a microcosm of society — and a bastion of steady employment. The effects of Trump’s shocking strike against the trans rights movement could be much more severe than anyone realized initially. By some estimates, the U.S. military is the single largest employer of transgender people on the planet, with an estimated 15,500 active-duty trans personnel. Trans people are twice as likely than the general population to serve their country, according to the study “Still Serving in Silence: Transgender Service Members and Veterans in the National Transgender Discrimination Survey,” by Jack Harrison-Quintana, policy institute manager at the National Gay and Lesbian Task Force, and Jody Herman, manager of transgender research at the Williams Institute. That’s partly because transgender Americans are patriots just like cisgender Americans, but it’s also partly because we still run far behind our cisgender peers in access to education, affordable housing and employment. Trump’s order means thousands of trans people won’t be able to turn to the military in search of a career anymore. And with his Department of Justice filing a federal court brief asserting that discrimination on the basis of gender identity is legal, the situation for trans Americans will only get worse. Trans people in America have an unemployment rate of 15 percent, three times higher than the general population. We don’t need righteous anti-Trump rants — we need jobs. It remains to be seen whether the administration will decide to discharge all trans servicemembers, as the Pentagon stated Thursday it would wait for official White House policy before moving forward, leaving trans people currently serving in place for now. If they return to the old policy under “don’t ask, don’t tell” at some point down the road, trans troops would be receiving general discharges marked “mentally unfit for duty.” As a result, they wouldn’t be able to access any veterans’ benefits, including the VA health care system or education credits. Troops who did nothing but dare to serve their country openly will be thrown out on the streets with a record that harms their future job prospects. The Trump ban is unnecessarily cruel to our fine trans people in uniform. I hope those blue-collar voters take a look at how much time, money and other resources were spent studying the readiness and economic impact of allowing trans troops to serve and wonder why their president fired more than 15,000 brave trans people in uniform to play electoral politics at the expense of one of the most underprivileged demographics in the country. Being able to enlist for military service is the bare minimum of effort at trans inclusiveness. Katelyn Burns is an essayist and a trans woman. She lives in Maine with her two young children.